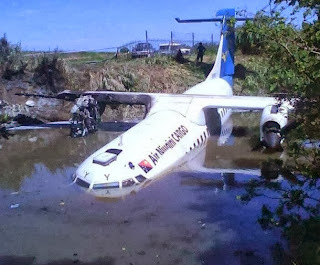 An Air Niugini Avions de Transport Regional ATR-42-300, registration P2-PXY performing a freight flight from Madang to Tabubil with 3 crew, rejected takeoff from Madang's runway 25 due to an engine fire, but overran the end of the runway and came to a stop in the waters of the Meiro Creek .
. An investigation team has been launched on site. The Minister especially thanked rescue services for their prompt response to the accident. The aircraft belongs to Farn Air and was leased out to Air Niugini being operated on Air Niugini's AOC. Meanwhile Air Niugini advises that with reference to the incident in Madang, the airline is fully supporting the Accident Investigation Commission and will be providing whatever information to assist. 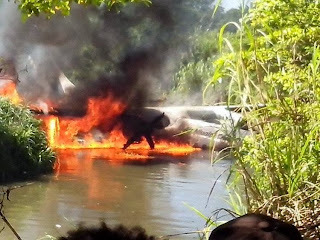 Air Niugini can confirm the flight was a cargo aircraft with no passengers and three (3) male crew only. Air Niugini's primary concern at this stage is for the well being of the crew. They are safe and being flown back to Port Moresby with the company Doctor. With respect to the cause of the incident, it is not proper for Air Niugini to comment while the investigation is currently underway other than to fully co-operate wih all authorities. During its 40 years of operations, Air Niugini remains committed to the highest safety culture and value the standards that the company provides to our valued customers both within Papua New Guinea and internationally. Air Niugini wishes to reassure our valued customers that we will maintain our normal schedule and all flights are operating as normal.